Last night, Hollywood’s elite and A-listers from the fashion, music and entertainment industry alike such as Terrence J, Karrueche Tran, Laverne Cox, Andre Harrell, Marlon Wayans, Comedian Lil Rel and Teyanna Taylor congregated for the CÎROC Black Raspberry Family Dinner at CATCH LA. The evening was a night to remember as VIP guests gathered together right before Christmas to toast to philanthropy, partnership and the Sean Combs Foundation. In commemoration of innovation, eleven years of collaboration and the limited-edition CIROC Black Raspberry, Diageo surprised the Sean Combs Foundation with a $100,000 donation to propel and support Sean “Diddy” Combs’ philanthropic initiatives in his hometown of Harlem, New York. 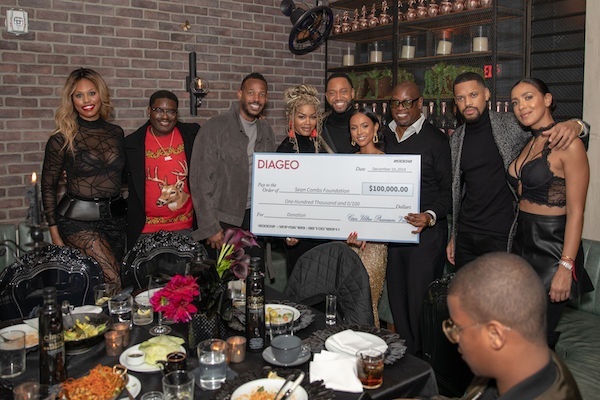 Music mogul and long-time friend Andre Harrell collected the generous donation on behalf of Diddy and the foundation, thanking Diageo for the donation. The dynamic duo encouraged everyone to join forces to give back in the spirit of community and pushing the next generation of creators forward. In the spirit of partnership and giving back, Terrence J announced that he will volunteer as “celebrity substitute” at Capital Preparatory Schools in the new year.